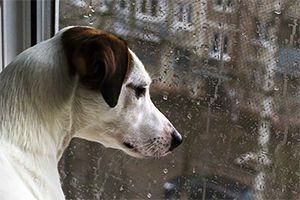 No matter where you live, you’ll most likely encounter days when freezing temperatures, ice and snowstorms, torrential rains, gale force winds or even extreme heat waves keep your dog stuck inside the house. Deprived of their normal walks and outdoor exercise, pups can get restless and bored, which can lead to depression and even destructive behavior. 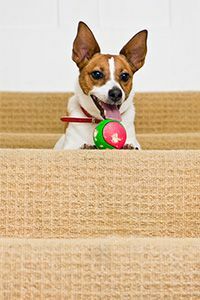 Here are some ways to keep Fido busy and happy – and not bouncing off the walls – when he must stay indoors for extended periods. There are many canine toys and puzzles designed to be stuffed with treats, which can keep your dog happily occupied for long periods as she figures out how to extract the delicious morsels. Add to the challenge by making your dog first find the toys themselves. Hide several treat-stuffed toys in different spots around the house for her to sniff out. Be sure to use treats that have a mouthwatering aroma and taste that will draw her into the game, such as Crazy Dog Organic Train-Me!, made with real organic chicken or organic beef and vegetables. Playing Fetch! 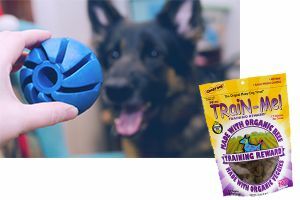 is an easy way to give your dog vigorous indoor exercise – you just sit there and throw the ball or toy, while he does all the work! But how about taking the game to a 3rd dimension by tossing the retrievable object up and down staircases and onto couches and chairs (if your pet is allowed on them) to add jumping to the workout. Another variation is to play the game with non-toxic children’s bubbles, the kind you blow with a wand. Dogs will love chasing these “evaporating balls” as they fly through the air, even though they can’t actually retrieve them. 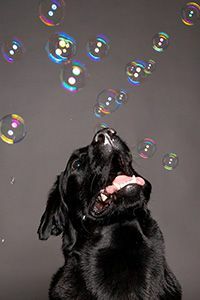 The bubbles’ novelty and weird behavior will add mental challenge too, as canines try to figure out what they’re all about. Use the time spent indoors as an opportunity to teach your dog a new trick. This will be fun for both of you, and the challenge will be a good antidote to boredom. 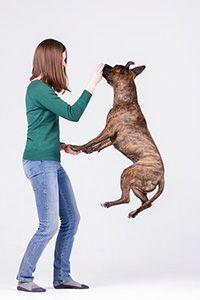 You can find ideas for tricks, along with instructions and videos on teaching them, at many sites online, including 40 Tricks To Teach A Dog That Will Wow Your Neighbors. Speed up the learning process by rewarding your dog with delicious treats, such as Crazy Dog Organic Train-Me! treats. Relax and bond together, while getting in some essential canine hygiene, by giving your pup an extended grooming session. Pamper her with some gentle brushing, followed by a bath with spa-quality Crazy Dog Shampoo, available in luscious Green Apple, Baby Powder and Pina Colada fragrances. 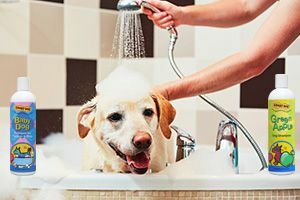 As an alternative to bathing, you can give her coat a touch-up with Crazy Dog Grooming Spray, which will clean, condition, detangle and leave a long-lasting scent. Either way, she’ll enjoy being cuddled and feeling like she’s the center of your attention. You can also include ear cleaning, nail clipping and toothbrushing as part of the routine. Invite one of your dog’s four-legged BFFs over to your house for a play date. This will cheer up both housebound pups, and probably be greatly appreciated by the other dog’s parent as well. 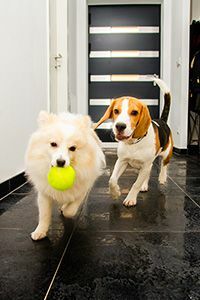 Set up an area with open space that the two dogs can run around in – whether it’s a basement, garage, or even a family room that breakable objects have been removed from. Be sure to have plenty of toys on hand, such as balls, squeakies and tug-of-war ropes, along with some tasty snacks the two pals can enjoy during downtime, such as Crazy Dog Train-Me! Treats.